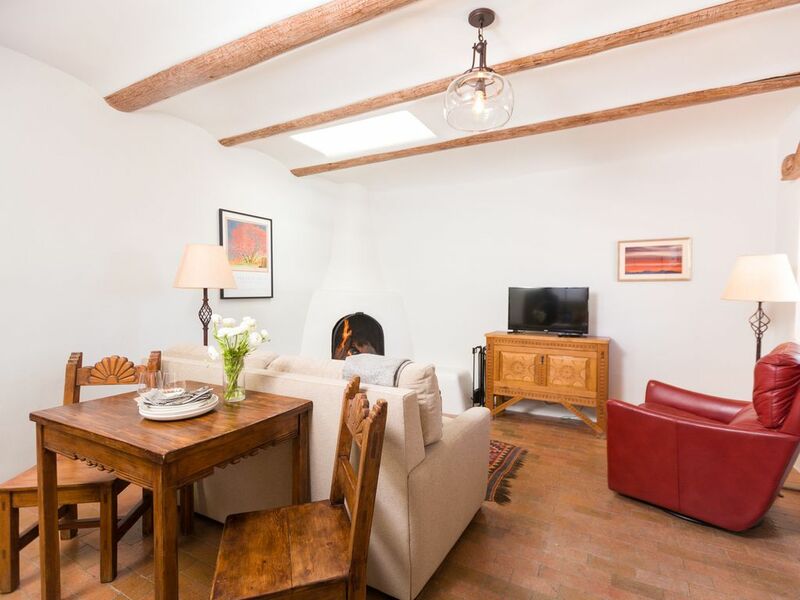 In the heart of downtown Santa Fe, Casetta Bel Canto at Casa Peña Serena is located on a quiet cul-de-sac. Each three units have historic New Mexico architectural details, and modern upgrades, provide all you need for a home-away filled with comfort and serenity. NEWLY REMODELED: Casetta Bel Canto (Unit 1) is a 1 bedroom, 1 bath, with Queen bed and Full size sofa sleeper, including high grade supima cotton linens. Accommodates up to 4 people. With an open concept design, it is bathed in light from three skylights, while still being cozy and private. Including a fully equipped kitchen, off-street parking spot, WIFI, and keyless entry, this casetta ("little house") is has Santa Fe charm with modern amenities. We have hopefully provided everything you need, and nothing you don't! Casetta Bel Canto is our most compact unit; this unit is perfect for couples, business professionals, individuals and children. Casa Peña Serena (Serene Home) offers 3 fully furnished guest houses for your vacation. Rent them together (capacity 12) or separately. See our property history, an overview of all units, and links to our favorite nearby restaurants and attractions. We feel everyone should experience a good night's sleep and therefore we've provided tempurpedic sofa sleepers so that all beds are equal. All casettas include: WIFI, cable TV, and 'kiva' fireplace, AM/FM/Bluetooth speaker for streaming music from all your devices, and 24 hour emergency support. Shared: Enclosed patio and lounge furniture and picnic table, top-of-the-line BBQ grill, and separate laundry room with detergents provided. * We do not allow pets at this time. Hi there! I'm Hether, Booking Director of Casa Peña Serena. I've lived in Santa Fe for 10 years, and am originally from California. I moved here for the amazing combination of access to nature with world-class culture, in an easy-going city that is Santa Fe. I own Canyon Fine Art, and am an art agent and design consultant if you need advice on the incredible art market of Santa Fe while visiting! You'll see me here with my trusty sidekick Mica who loves to mix business with pleasure as much as I do, —with hiking trails 5 minutes from downtown, we fit one in as often as we can. The property owners are art clients of mine, and when this property came on the market, we teamed up to renovate and modernize, while preserving the unique historic charm of a 100-year-old adobe triplex. I jumped at the chance to upgrade each casita with modern amenities, while still respecting and highlighting Santa Fe's unique architecture and history. We aimed to create a sanctuary in each casita, reflecting our love for Santa Fe, and establishing an environment where you can feel comfortable and enriched; a home-like environment down a quiet residential street, with hotel amenities. Telephone in laundry room for all units to use in emergencies. Mini-Split wall unit for overall ambient temperature control with remote. Not a traditional AC, but functions by keeping the air temperature even and comfortable. Radiant floor heat, plus Mini-Split wall unit for ambient temperature control. Hotel grade supima cotton sheets and non-allergenic pillows. In a separate laundry room on property for all units to share. Detergents provided. In a separate laundry room on property for all units to share. For use between Nov 1st and May 1st. With firewood & ash disposal provided. One off-street parking space per unit provided. Kuerig Coffeemaker and a few coffee/tea/creamer/sugars provided for your first few mornings! Also Iconik Coffee within 3 blocks and Starbuck's Coffee within 5 blocks. Dishes for 4 people. And separate plastic dishes provided for patio dining. Fully equipped kitchen with all you need for cooking...or reheating those delicious leftovers from our amazing local restaurants! Tivoli FM/AM Radio with Bluetooth for connecting to your devices for streaming. Superb sound! Casetta Bel Canto has three units of various sizes that are perfectly stocked and comfortable for a short or long stay. We stayed in two of them because we ended up staying longer than we anticipated and moved to another one of the units. The location couldn't be better for walking to old town or the railroad district and is a reasonable walk to the commuter rail if you are coming from Albuquerque. Rick was responsive to our questions and shared tips about where to go and what to see. Laundry facilities, parking and the shared patio are a plus. We will definitely stay here again. Unit was close to the Santa Fe plaza. Nice fireplace, well decorated with quiet courtyard. Wonderful place! My husband and I have been coming to Santa Fe once a year for 28 years and this is definitely one of the BEST places we have stayed! It was exceptionally clean and organized and supplied well! Having the laundry room was a real plus because we had a spill in our luggage! The courtyard was so well done and we loved the apple tree and the thud of dropping apples! Our casita, #1, was so well done and that bed was so comfortable! It’s also a perfect location! Thank you so much - we had a great time! My wife ad I stayed 7 nights at this jewel and loved every minute of it. Firstly, it is well located in a quiet residential neighborhood, which is in easy walking distance to the Rail Yard district and its amazing Farmers market and a variety of restaurants. Walking to the main Plaza was also a pleasant 20 stroll-minute stroll. The unit itself is very well appointed with tasteful and authentic design elements. What was most pleasing is the high-quality touches, such as very good bed linens, bathrobes, plenty of storage space, well-equipped kitchen, exceptional common outdoor space to enjoy any time of day, high-end BBQ and well-stocked and (also) well-equipped laundry facility. We cooked, we worked indoors and outdoors with excellent WIFI speed/access and we so enjoyed seeing the sunsets from a little two-seater table right outside the front door. We would definitely come back. We loved this place! Perfect small Casetta. Week done restoration and clean. Parking 8’ from door. Near the hub of Sandra Fe but far enough to be very quiet. We would return. We are so grateful for your rave review! We really wanted the couches to be just as comfortable as the beds, and am so happy to hear this wonderful feedback. We loved having you and will look forward to your return!